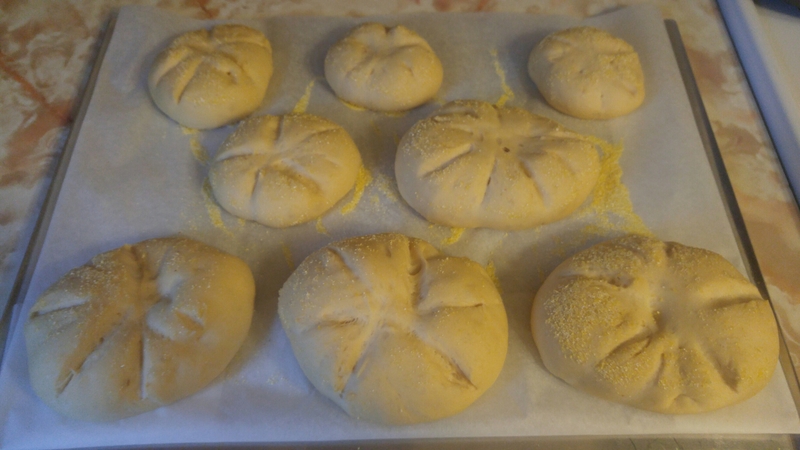 Chris and I watched a fascinating documentary on BBC a week or so ago which inspired me to tackle Kaiser rolls. The documentary was called Victorian Bakers. It featured four modern professional bakers who for a period of time gave up their successful businesses to explore the history of bread in the U.K. during the Victorian period. That would be roughly from the 1830’s to the early 1900’s. The documentary was split into three episodes. The first episode was set in the 1830’s where the intrepid bakers settled into a rural community in an authentic bakehouse of the era. That meant heritage flours, wood fired oven without a thermostat, troughs for kneading and brewers yeast. A far cry from today’s electric and gas temperature controlled ovens, our Kitchen-Aid stand mixers, the $2.49 packages of instant yeast and bread flour from who knows where with who knows what in it. I sound a little negative regarding our modern breads but I truly believe that those were halcyon days for the bakers where ingredients were concerned. Gee, I wonder if I could successfully bake bread in the Joe? What I found interesting about the 1830’s bakeshop was that there was no storefront, the bakers had to deliver their goods door to door in their community. The price of wheat went through the roof in the 1840’s due to poor harvests and the economy took a turn for the worse. Barley bread and crammings are made to feed a starving people. Crammings are basically chicken or livestock feed. All the goodness is taken from the wheat, the bran and the flour, what is left is fed to livestock and the poor. The spirit of the 4 bakers soured measureably at having to make and try crammings. Episode #2 features a move from their pastoral bakehouse to an urban bakery during the Industrial Revolution. The ovens are now coal fired and soot is everywhere. Because they are in an urban setting the population is larger. The middle class demand fancy breads for breakfast and that means that the bakers have to work overnight. Their outout has to double and they are still kneading dough by hand. The foulness of their living and working conditions leads to utter exhaustion. Their spirits are broken they are asked to recreate breads of the 1870’s with adulterants like alum (an astringent ingredient used in anti-perspirant and an irritant to the stomach) and chalk. The final episode took place in the 1900’s. The four bakers were now working in an elegant shop on a main street of a prominent town. Mechanical progress had been made in the bakeries themselves as mixers and steam ovens had been invented. Sugar is inexpensive so in addition to luxury breads, cakes and pastries were a required part of the bakery. I find it interesting that the bakery of the early 1900’s hasn’t changed a whole lot from the standalone bakeries of today except that the pastry products of today are a little more refined and polished. The program was fascinating and well worth the 3 hours we invested in it. I was most taken with the Kaiser rolls featured in the final segment. 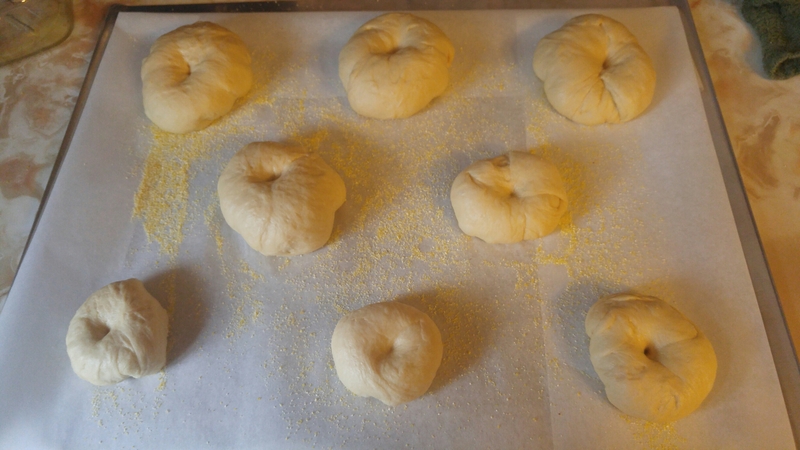 The bakers showed the viewer how to make a Kaiser roll and it looked to easy and cool I decided that it would be the next bread I would attempt in my baking challenge. I remember vividly Kaiser rolls from my childhood. My mom would purchase them from Buns Master Bakery on Kaladar here in Ottawa. I was never fond of them because I found them to be dry and as a child messy on account of the semolina on the base of the bun. The Kaiser pictured on page 184 of the BBA looked nothing like the Kaisers of my childhood memory. 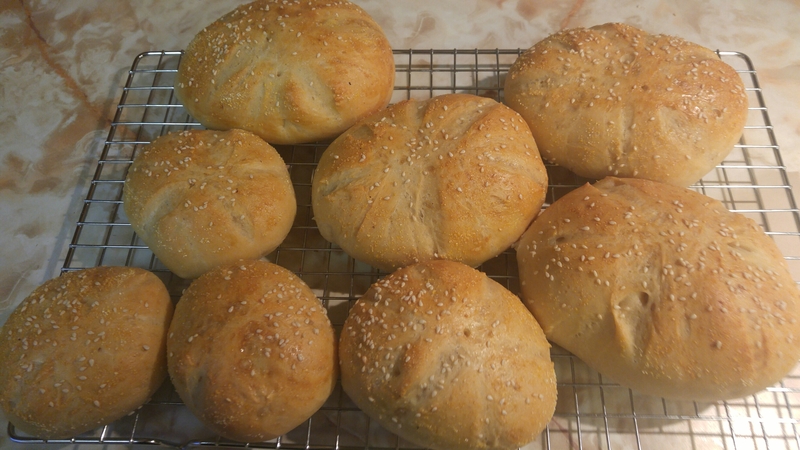 Kaiser buns are a hard crusty breakfast bread that are Austrian in origin and are very popular in European countries such as Poland, Czech Republic, Hungary, Germany etc. They are traditionally served with butter and jam. This bread took two days to make. I apologize because for whatever reason I did not take a lot of pictures while making this bread. The first day took about an hour and a half to make a pâte fermentée. The recipe listed gave me no difficulties and in our home it required an extra 15 minutes for the pâte to swell, whereupon it was put in the fridge overnight. Making the dough itself gave me no issues. The dough from the recipe as written was lovely to handle, and no extra time was required for fermentation and prooving. 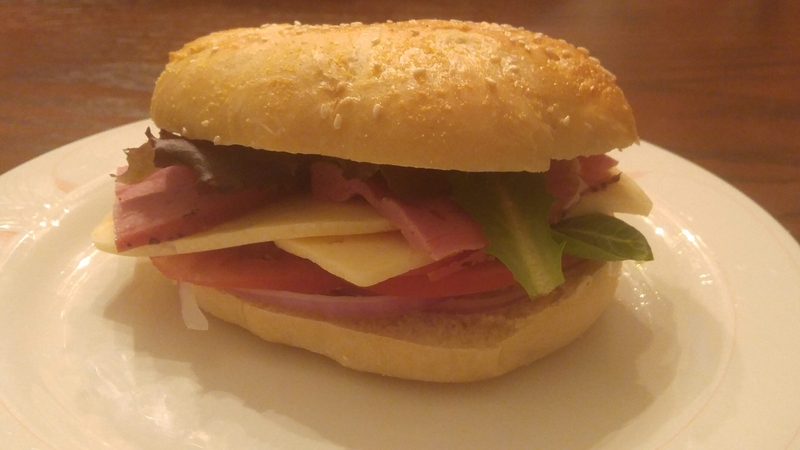 Okay, clearly I missed something in the shaping of the Kaiser roll. There is no crying in boulangerie, even when something becomes an epic fail in the shaping department. 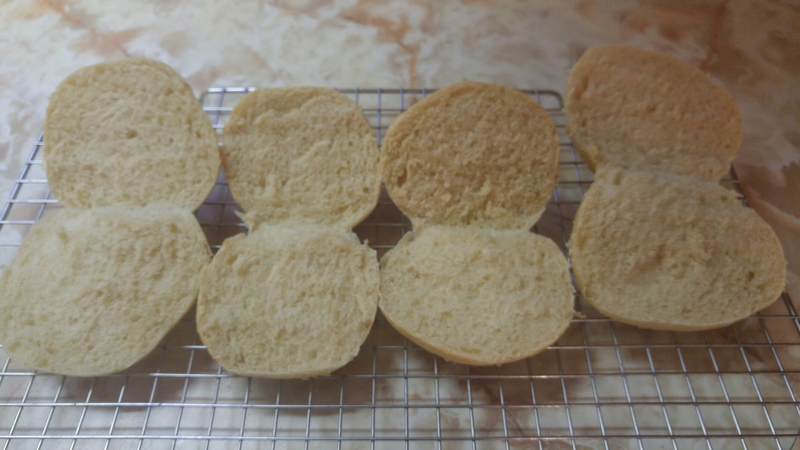 Shaping these rolls was not as easy as it looked on television. It doesn’t matter, they were delicious. The crust and crumb were amazing. As a mom, it’s a fantastic day when everyone around the table tucks in and finishes everything on their plate. That was the case today. I had decided that for dinner I would serve smoked meat and ham sandwiches on the Kaisers. The condiments were tomatoes, onion, butter lettuce, pickles, mustard, mayo, Havarti cheese, salt and pepper. Okay friends I can not begin to tell you how much I enjoyed this bread formula and this sandwich. It will go down as the best sandwich I have ever had. I am still thinking about it. Chris and I both rated the roll full marks except for presentation which was essentially baker error. I have since looked at videos on how to shape a Kaiser and will be able to perfect it the next time I make it. A parting observation based on viewing the documentary. Radical change happened from the 1830’s to the 1900’s in the making of bread. Our nation and as a populace in general, we have gone from organic, heritage flours and brewers yeast with long fermentation periods to packages of bread with 37 plus ingredients in them. Bread is water, yeast, salt and flour…four ingredients. Good bread takes time to make…time is what fermentation is all about and what makes bread delicious. Most of the breads I am recreating in this little challenge take two sometimes three days to make. 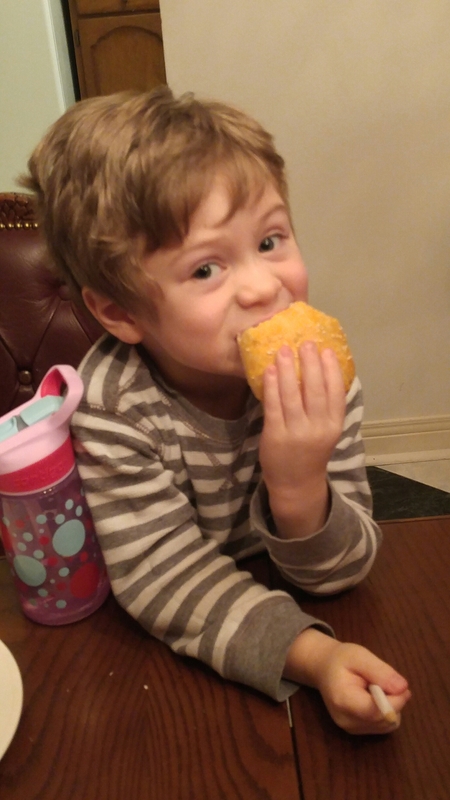 When there is fresh bread in the house, my children become ravenous wolves…there are no leftovers. Since the Industrial Revolution, we have become obsessed with speeding up the breadmaking process. Today, more people are asking the important questions: Where does my food come from? How is my food treated before I eat it, because what I eat directly effects my health and that of my family. It feels like we are coming full circle to the halcyon days of the 1830’s as organic, heritage flours are becoming more accessible to home bakers such as myself.